In the midst of rampant copy/pasting from web sites directly into book reports, and where the sidewalks are choked by vendors of cheap, badly copied bootleg movies, games and music CDs, I guess this had to be expected. The newspaper Radikal reports that the book translator and publishing labor unions here have released a report citing that a number of the "100 basic works" of literature recommended to students by the Ministry of Education are pirated translations, while others have been inexplicably abridged or altered to be more ideologically appropriate. The labor unions investigated 154 books and found that 58 were plagiarized, with translations falsely attributed or not attributed at all. These included 6 of 11 editions of Fathers and Sons by Turgenyev, 6 of 14 editions of London's White Fang, 11 of 25 editions of Les Miserables (including one abridged down to just 80 pages), and 9 out of 14 editions of Crime and Punishment. 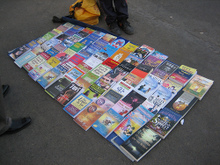 Going beyond the ethics of individual purchases of pirated publications is the problem that the Ministry of Education, by creating a reading list that is more required than recommended, consequently passes on a huge windfall to companies that violate international conventions protecting intellectual property.